I took my in-laws car shopping today. They currently have a father forlorn Acura TSX, and since they’re getting on in years they want a CUV of some sort. I tried really hard to get them to live the CX5, but they weren’t having it. 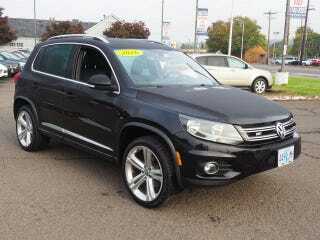 I think they will end up with a brand new Tiguan SE. It seems nice enough. While we were there, I checked out this little guy... It’s a 2016 R-Line (didn’t even know that was a thing) with 20k miles for was seems like a crazy cheap $18k. What are Oppo’s thoughts on these? It rides a bit rough and has a decent amount of road noise, but the driving dynamics are on point for a cute ute. This might be good wife car material. Bonus pic of my big American boi with ze big German bois.